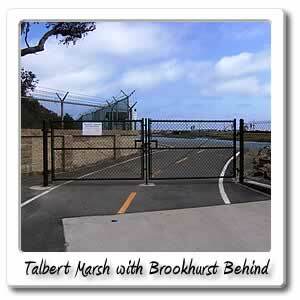 Welcome to Talbert Marsh on the Santa Ana River bicycle trail. Just a little over 400 feet and 30 seconds of a ride, from mile marker 0 is The Talbert Marsh Trail which is asphalt paved with asphalt and is completely flat. It starts at the Santa Ana River Trail, and ends at Brookhurst Street and the focal point and purpose of the trail is the Talbert Marsh. The trail itself is .4 mile long and will take about 2 minutes to get from either end, with Brookhurst Street, on the West end of it. 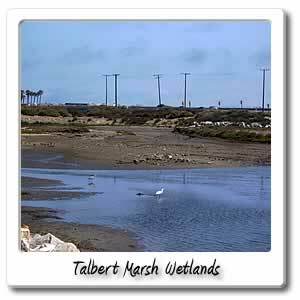 Talbert Marsh Ecological Reserve is a 25 acre wetland, completed in 1989 and is owned by the Huntington Beach Wetlands Conservancy, that was restored for flood control and wildlife. You can spot 80 species of birds, with certain ones prevalent, according to low or high tide. 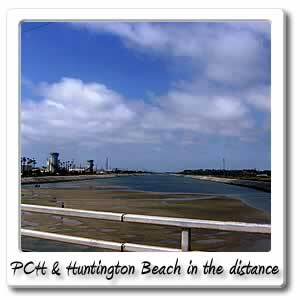 Salt water only enters this area twice a day, via the Talbert Channel, that empties out to the Pacific Ocean. There's even Mud Flats, that were created for the endangered Light-footed Clapper Rail. It also has a sediment trap, to capture incoming sand from the beach. Just behind the wetlands, you'll find the Waste Water Treatment Plant. Years ago, you could smell heavy chorine, and other odors, but the public probably complained for years about the smell, since it's not prevalent in the area anymore. Going west there are three other wetlands, that can be accessed from Pacific Coast Highway. The next closest is the 67 acre Brookhurst Marsh between Brookhurst and Magnolia. The next is the Magnolia Marsh between Magnolia and the Power Plant and features a elevated observation deck. The third Marsh is the 65 acre Newland Marsh, that still needs to be acquired from Cal-Trans. None of the other wetlands, have a bike trail going through them.